Mexican President López Obrador has declared his support for the leader of the Labour Party to become the next British prime minister. He made the endorsement of Jeremy Corbyn, whom he described as “my eternal friend,” during a gathering of high-profile friends at López Obrador’s ranch in Palenque, Chiapas, yesterday. López Obrador, who is being sworn in on December 1st, posted a video to social media in which he appears with Corbyn, Miguel Ángel Revilla, president of the Spanish autonomous community of Cantabria, and Cuban singer Silvio Rodríguez. “. . . We’re Hispanic but we have good relations with all the people and all the nations of the world and we especially have a very good relationship with the planet’s progressive movements,” the new president said. “We have a very good relationship with the United Kingdom labor movement, we identify with each other because progressive governments, democratic governments respect migrants and respect the right that all human beings have to seek a [better] life, that’s the principle of human rights,” López Obrador continued. The leftist political veteran also appeared to make a veiled attack on the hardline attitude of United States authorities towards the thousands of Central American migrants currently stranded on Mexico’s northern border. “The United States is a country, a nation that became a power because of the work, effort and intelligence of migrants,” López Obrador said. He then declared his unequivocal support for Corbyn to become the next leader of the United Kingdom. 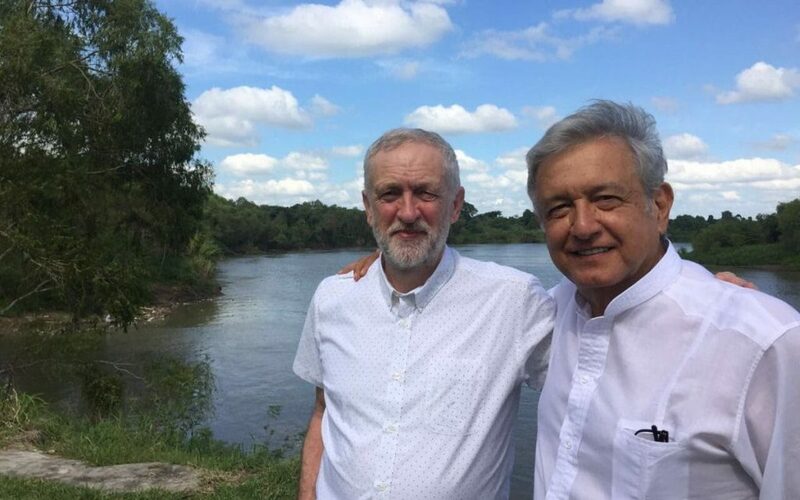 “Those from Latin America, the Caribbean, the United Kingdom, are our brothers and now the English people will have the opportunity – I hope, I want it with all my heart, with all my soul – to have a prime minister like Corbyn,” López Obrador said. “I don’t know what the laws are, I’m not yet formally the president of Mexico, I won’t be the constitutional president until tomorrow, that’s why I dare to say these things. From tomorrow I have to put a limit on myself but now I say what I think and I have always said what I think,” he added. Jeremy Corbyn is married to Mexican lawyer and activist Laura Álvarez. This entry was posted in Blogs, International Trade Unions, Labour Party, Media, Politics, Trade Unions. Bookmark the permalink.